The recto of the sheet is mainly concerned with a comparative study of the expressions of fury in horses, a lion and a man, done as 'background research' towards Leonardo's mural of the Battle of Anghiari. In early 1503 Leonardo agreed to paint a huge mural of the Battle of Anghiari in the Sala del Gran Consiglio of the Palazzo della Signoria in Florence. The painting, to be some 20 metres wide, was to depict a celebrated victory of 1440 against Milanese forces; the following year a pendant, the Battle of Cascina, was commissioned from Leonardo's young rival Michelangelo. Work on the Battle of Anghiari proceeded with interruptions until May 1506, when Leonardo was allowed to travel back to Milan, initially for three months, to work for the French occupiers of that city. But he never returned to the project, and only a portion of the centre of the painting, depicting a cavalry skirmish and generally known as the Fight for the standard, was completed. This was widely copied before its replacement by Giorgio Vasari's frescoes after 1563; recent attempts to locate Leonardo's mural beneath Vasari's work have been inconclusive. The Battle of Anghiari, more than any other composition of Leonardo's career, gave full rein to his interest in the depiction of powerful emotion. While the passions in the Last Supper were intense, decorum prevented Leonardo from showing the apostles hurling themselves around the table. But the decorum of a battle scene was extreme violence, and in this preparatory drawing he studied the indicators of fury in the faces of man and horse (and, for comparative purposes, a lion). 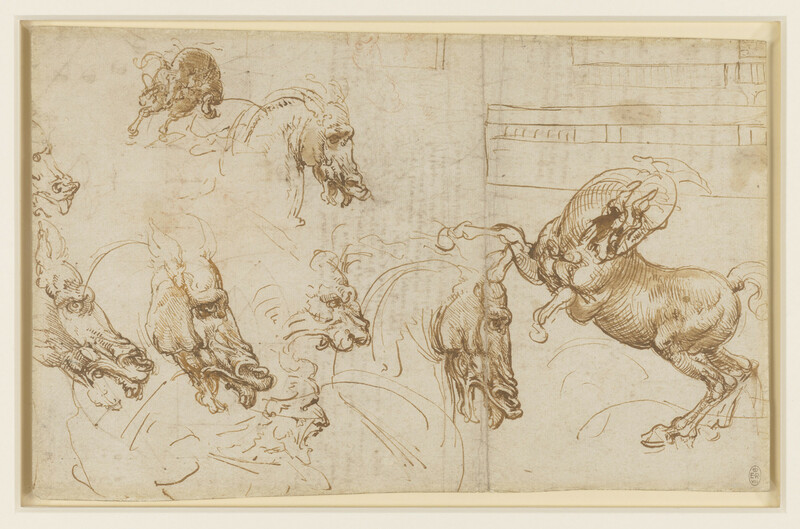 A list of Leonardo's books made around this time includes 'a book of horses sketched for the cartoon' which must have contained many similar sketches. The reverse of the sheet is a typically Leonardesque compilation of sketches, notes and diagrams, though several are fragmentary, due to an early owner – presumably Francesco Melzi or Pompeo Leoni – cutting the sheet down to 'improve' the presentation of the horse studies on the recto . At the centre of the verso is another sketch of a horse's head, and one of the heads from the recto has been traced through with black chalk. Along a short edge of the verso is a pre-Copernican diagram of the solar system, with the earth (labelled terra) at the centre, the moon in the inner orbit, and the sun (sole) in the outer orbit. A series of projected lines show how the relative positions of sun and moon give the phases of the moon as seen from the earth; a similar demonstration was presumably given by the fragmentary diagram in the opposite corner.